I am trying to work it out in my head how to install my ceiling. I have disposed of the original steel panels and fiberglass insulation. My plan is to have foam sprayed and then I'm leaning toward tongue-and-groove pine. What stumps me is how do I install it without creating a thermal bridge? Everything I've read about a proper floor installation says I should do a floating floor, in part because screws into the metal floor would create a thermal bridge into the interior space that could result in interior condensation and all sorts of unpleasantness in the long term. But then I see almost universally people are just screwing their ceilings into the metal ribs which are connected directly to the exterior sheet metal thus creating that same thermal bridge into the bus. How do I avoid this, or am I looking at this wrong? I thought about this, but it seems I couldn't install the ceiling because the "studs" (or whatever you want to call them) are now running the same direction as the tongue-and-groove pine, so many rows of the pine will have nothing to which it can be fastened. At least that's how it appears to me. I don't disagree, but would point out that the concern with the screws isn't necessarily losing heat, but having hundreds of cold points of condensation inside a warm and humid bus. You could score /notch one side of your strips and bend it around the raidais of the ceiling. basically you is base on aerogel and is a strip that covers the side of a 2x4 metal stud and it has a high R value and compressible capabilities that help in reduce the thermal bridging between metal and other surfaces. Basically anything that you attach to the ribs or floor has to be cover by one of this strips and secured by a STAINLESS steel screws and you should be good to go(stainless has better thermal properties that other metals). I calculated that for my bus I need to expend like $320 USD to cover every rib and floor frame and some other areas and I have a short 22 feet bus. I haven't tried but I think it could help, I'm going to alaska in the my bus next winter with the family so everything that can help in saving energy helps I think. 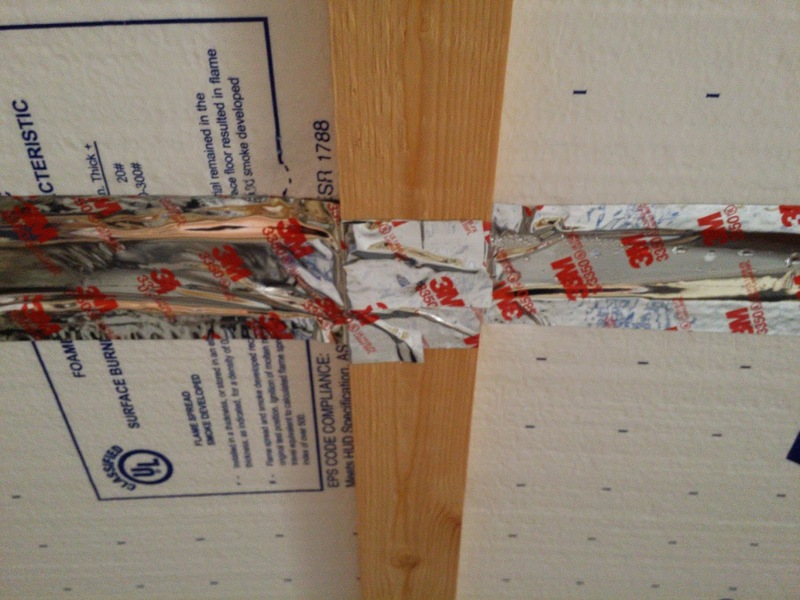 I havent done my ceiling yet but on my wall studs I ran strips of the thin, 4" wide closed cell foam that comes in roles normally used on houses between sills and foundations. I found it to be a very effective thermal brake between the plywood and metal studs without being too thick. 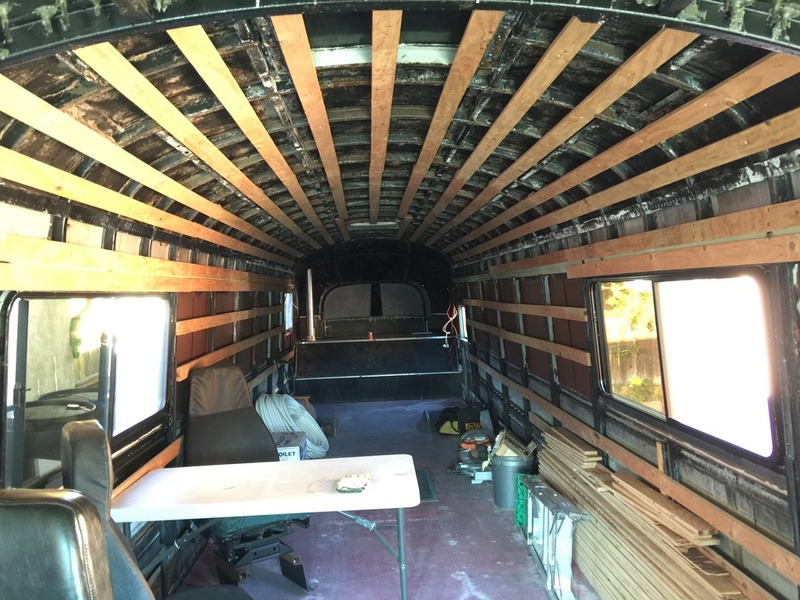 I plan on doing the same thing on the ceiling, using spray adhesive to stick the foam to all the ribs, then I will screw up 1/4" plywood sheathing, followed by the light weight pine T&G paneling running the long way as you suggested. I plan to use a combination of finish nails and liquid nails adhesive to secure the t&g to the plywood. There will be no screw heads on the finish surface that connect to metal ribs. One thing I have noticed so far even with an unfinished ceiling is that thermal bridging is not so much a matter of transferring coldness, but condensation issues. The first cold night that we had an electric heater going I saw condensation collecting on ceiling ribs. But as soon as we got the wood stove going, obviously a much dryer heat, the condensation was not an issue. But if you are using electric or propane heat, condensation on screw heads, etc. is something to really think about. Single side adhesive acrylic foam, like the kind that you stick on a pickup truck bed and then set the canopy on, is a pretty good insulator. 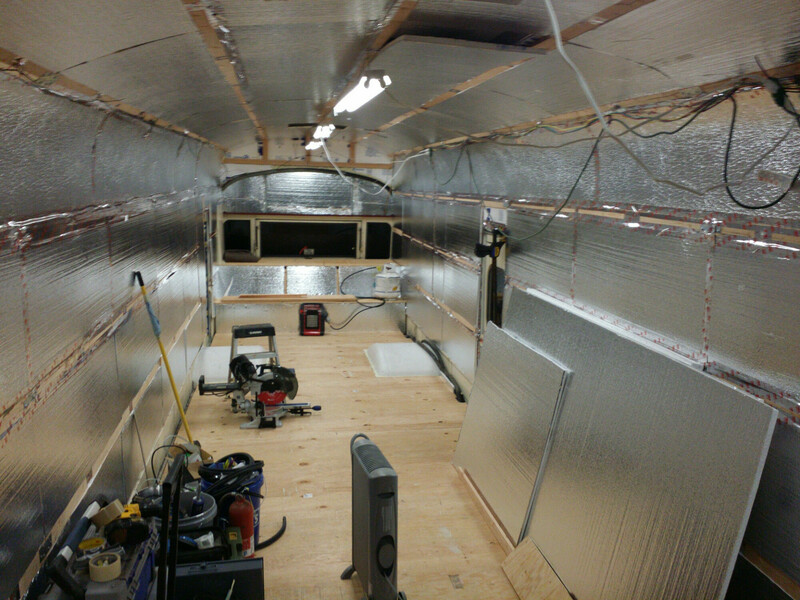 I used a combination of wood strapping going the length of the bus, and rigid insulation board tucked behind and flush with the boards (2" + 1", total 3") I just used hex head self drilling screws to attach the strapping to the steel frame. As for running t&g boards the same direction, I'd suggest buying some metal strips, attaching those to the wood straps, so you have a criscross with the wood acting as the thermal break. Perhaps you could use those long aluminum strips for transitioning a carpet run? They are flexibile and have some rigidity. Install one every 16 inches, they will be the strapping substrate for the t&g. Wherever the t&g lays on top of a wood strip, make sure you add material to keep from pulling the two layers together (the same thickness as the aluminum strips) and it should be pretty strong.